The Cherry Homes Hotel and Residence. 3 Floors with more than 170 rooms available. Private bathroom in every room (hot/cold water system). Free laundry and cleaning services (housekeeping). Common kitchen and dining room on each floor. 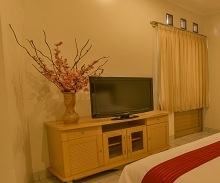 Entertaintment room with LCD television. Meeting and multi-purpose room (more than 100 people). The Cherry Homes Hotel was started to operate in April 2005, with close to 75% occupancy level at the first 3 months. We have regularly catered many VIP guests from movie stars to high-ranking government officials. We have been profiled by several media from the local paper to several nation wide television station (TV7, TransTV, ANteve, STV and Bandung TV).